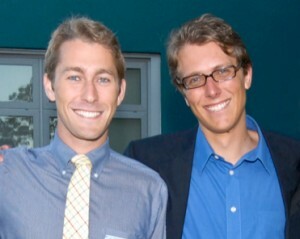 Interview with the founders of Phone Halo, who raised over $400k on Indiegogo. I got to sit down recently with my friends Chris Herbert and Christian Smith, have a glass of wine, and talk about their great success with their crowdfunding campaigns, raising over $400,000 for their company Phone Halo on Indiegogo. Phone Halo makes some amazingly useful location and proximity tracking hardware and software that alerts you when you’ve misplaced your phone, keys, wallet, or anything else, and shows you where it is. It’s one of those rare inventions that everyone obviously needs. The times before Phone Halo’s ubiquity will probably be viewed as a kind of dark age, with countless hours of human life needlessly wasted flipping couch pillows and rummaging under car seats. 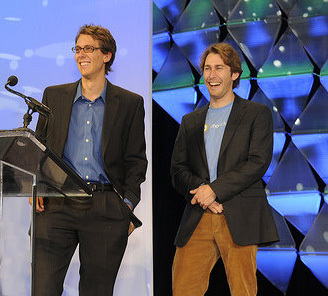 I originally got to know Chris and Christian when we were studying together in the Technology Management Program at the University of California Santa Barbara in 2008. This was before crowdfunding was a thing. Our professors were all engineers, startup founders, and venture capital investors. They taught us how to build and grow technology companies. Chris and Christian were two great engineers that were able to take those business lessons to heart, and to grow their own venture out of the lab and into a viable and commercial product. When CrowdFunding became an option they saw it as the perfect way to make sales and increase audience for their products, and they’ve seen huge success. They’ve embraced crowdfunding whole-heartedly and become one of Indiegogo’s shining successes stories. What really comes through in their campaign is their personality as inventors. It’s just so much more personal than buying something in a box on a shelf. The story is important. You really know who made it and why. CrowdExpert: How much progress had you made with Phone Halo before you launched your CrowdFunding campaign? How much of a following or audience did you already have? PhoneHalo: When we started our first crowd funding campaign, Phone Halo licensed Bluetooth tracking products to 2 publicly traded companies and had around 15k users. CE: How much did you prepare before the launch of the campaign? PH: To prepare for the first crowd funding product launch, we connected with our customers and got feedback on what was important to them. We built functional prototypes to give our audience assurance that we could make the product. CE: Did you set your goal to the full amount you wanted or needed to raise, or did you intentionally set it low so you could bask in the glory of surpassing it? PH: In our first campaign, we set our goals based on what it would take to produce the product. Later we learned that people are more interested in contributing to crowd funding campaigns that are over 30% funded. We set our goal lower to connect with a larger audience. CE: What portion of your overall financing does CrowdFunding represent? PH: In 2013, a majority of our revenue came from crowd funding projects. CE: How many of your contributors would you guess were already fans and followers before you launched your campaign, vs. how many were direct connections of existing fans, vs. how many found out about your venture because of the CrowdFunding campaign or associated media coverage? PH: Crowd funding quadrupled our number of users. CE: What were your expenses for the campaign? PH: We invested in R&D for the products to create product prototypes, producing the campaign content, and time to promote the product launch. CE: Has your crowdfunding campaign gotten you any interest from institutional investors? PH: Our crowd funding projects generated a large number inbound business leads. CE: Why did you choose Indiegogo? What do you think of their platform? What do you think about all the other platforms out there? PH: Our first Wallet TrackR crowd funding project ran on our own site. 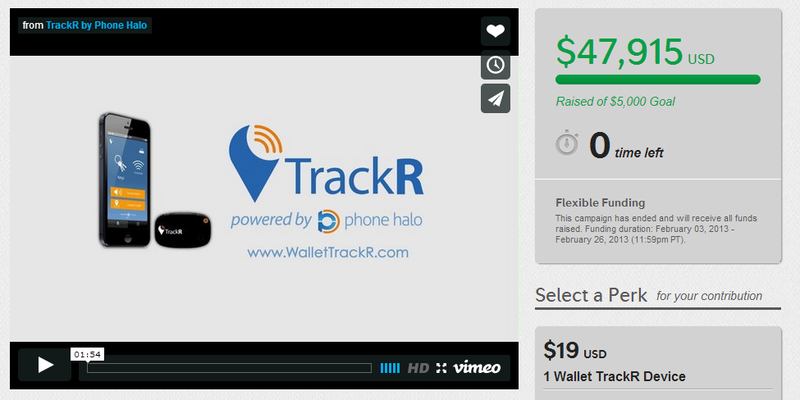 We re-launched the Wallet TrackR on Indiegogo and saw very interesting results. The biggest difference running on Indiegogo versus our own site was the increase in traffic to the project. Traffic to our first Wallet TrackR campaign was driven by traffic we generated and tended to be erratic, where there was a baseline organic discovery when on Indiegogo. Having a project on a crowd funding platform like Indiegogo gives people a way to find you. Indiegogo is a fantastic way to launch a crowd funding project and I would recommend it to anyone who wants to fund a campaign. Indiegogo has a dedicated campaign management staff that works with you to reach your goals. They are constantly publishing new handbooks and helpful hints to give the campaigners a better chance at success. CE: When promoting your crowdfunding campaign, what worked surprisingly well? PH: Making sure our bakers were keeping our backers in the loop with frequent updates was a very important part of creating a good relationship with our bakers. We are very honored that so many people came together to make Wallet TrackR and StickR TrackR happen. CE: You’ve launched two successful crowdfunding campaigns so far, correct? Will you be doing more? What’s the logic and the plan behind that? PH: We have a few other crowd funding projects in the works and will be announcing our plans in the future. We think that crowd funding is an awesome way to get feedback from our audience and the public. We listen very closely to our backers and make product changes, adjustments, and improvements using their feedback. CE: What did you do differently the second time? What will you do differently the third? PH: Our second Indiegogo campaign for StickR TrackR, we focused on two improvements: 1) giving backers awesome deals for supporting our project 2) communicating well with our backers. As a result of shifting our focus, we raised 5 times more. We will keep listening closely to our audience to understand what they want to see in our follow on campaigns. CE: How difficult is it to keep on top of questions, suggestions, misunderstandings, and complaints from your backers? Did any of them really challenge you on the risks and feasibility of your venture? Were they ever just stubbornly wrong about anything? Did you change your plan based on feedback from funders? PH: Since we had already created and shipped 3 consumer electronics products, we did not get much feedback on the feasibility risk. If our backers have a problem, we are always happy to refund our backers. Having happy customers is really important to our team. CE: I see you had 4 people on your crowdfunding team for Wallet TrackR, and 10 for StickR TrackR. Did you originally do everything yourself? Campaign Management? Video editing? Social media? PR? Finance? How did you put your team together? Did you find competent friends or did you hire outside experts or consultants? PH: That’s a great question. The team size was similar for both campaigns. We added more team members to the StickR TrackR campaign because we saw it helped our backers see the whole team and have a better understanding of our capability to deliver. Since this was our third hardware product, we did everything in-house. CE: Have you been approached by many people to help them with their crowdfunding campaigns? What portion of those sound like a good idea or bad idea to you? PH: We have been approached to give feedback on campaigns. Most campaigners who are smart enough to reach out for assistance had good ideas but a few campaigners had ideas I was not sure about the market demand for their product (as it turns out, those campaigns did not get funded). CE: What do people who are daydreaming about running their own CrowdFunding campaign often not understand about CrowdFunding? PH: Most who have a good idea that lack experience creating a product, underestimate the amount of work it will take to execute a project. CE: What does the media often get wrong about CrowdFunding? PH: I have noticed sometimes people may not understand the amount of time and effort to create a great project. It is counter intuitive that a product which seems simple to use is more difficult to create. I think it is the project creators job to respond to what people think and help educate them. CE: What or who were some good resources for crowdfunding info that you referred to while planning and setting up your campaign? Read books that help you communicate your product and pricing. CE: What were some 3rd party tools you used to automate, track, or otherwise help run your campaign? PH: Most crowd funding platforms, like Indiegogo, have a way for campaigners to measure all the necessary metrics. Google analytics, KISS metrics, and bit.ly are also useful tools. CE: Any other favorite, tips, tricks, or hacks? PH: There is no substitution for genuine caring. Have a $25 product option. Why? Campaigns with a $25 perk raise 30% more than campaigns that don’t have a $25 perk. CE: What are some other crowdfunding campaigns you have your eye on these days? PH: The last crowd funding campaign that I backed was ChargeKey. CE: What do you think about the potential for Investment Crowdfunding once the SEC’s JOBS act rules are implemented? PH: I think that most consumers are more interested in getting products for supporting a crowd funding project, not equity. CE: Thank you Chris and Christian for lending your expertise. I owe you each a glass of Grenache.